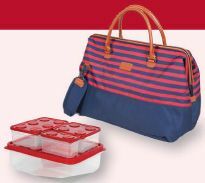 Impromptu picnics become a lot easier with Arctic Zone’s leakproof tote. The bag’s a little bulky, but it “can brave the campsite,” and it comes with an anti microbial liner, an adjustable shoulder strap, and a stackable, eight-piece container set. Ditch your bulky billfold for Ridge’s 2.5 oz, ultrathin front-pocket wallet. It holds up to 12 cards and it blocks thieves’ RFID-skimming devices. It’s also available in aluminum, in carbon fiber, and, for just $45, in polycarbonate. Designed for commuters who bounce between the office and the gym, Aer’s well-ventilated waterresistant backpack “keeps those two worlds apart, thanks to a clever system of pockets.” A quickaccess pocket keeps your wallet, keys, and earbuds close at hand.